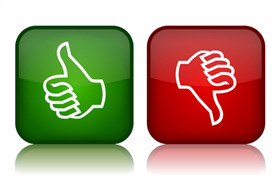 Make it very easy for your customers to give you feedback – good and bad. Just asking for good feedback means that all those customers who are unhappy will not participate and may go elsewhere. Likewise, asking for just bad feedback can result in staff becoming de-motivated as it will appear that they can’t do anything right. We all welcome programmes where you can give staff of a company you use a voucher to say well done, but if the same company makes it hard for you to complain, and when you do they don’t seem to care, then why bother?